Non contact level meter with 2CH measurement. Non contact level meter for medium to long distance of 0.3 to 20 m.
Easy to adjust the settings in the field. Immune to external noise and interference. For connections, screw-in and flange type connections are available with an angle adjustment function for powder and granulated materials. It has good cost performance due to the multiple amplifiers. * When 1 channel is used, two lines can be output (8 alarms and 2 current outputs). * Using two channels, low cost level measurement is possible. A large LED is used for display. The display not only shows levels, but echo wave form and trend graphs. Therefore, it allows easy adjustment locally. By apply correlational processing to the received ultrasonic wave signals, external noise and external ultrasonic wave effects are decreased. Eco graph screen and trend screen are standard. Various process setting functions on these screens allow high stability in poor measuring conditions. * Can be altered if required. Ex. : Monitor city water level, sewage, drain liquid, chemical agents (acids, alkalis), slurry, storage tanks, silos, etc. *1: The nominal measuring distance is determined by the static water level used as a reflecting mirror. It may become shorter with various measuring conditions. *2: The actual measuring range is determined by each measuring condition.For details, contact to our staff. 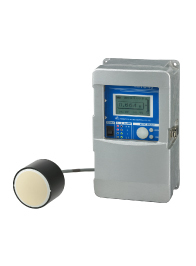 ◆ A meter with a weir meter function is also available as optional.